Dress: via Crossroads. Cardigan: Knitted Dove via Crossroads. Belt: Anthropologie. Shoes: Philip Simon (c/o). Bag: via Painted Bird. Hat: Vintage DIY. Bracelets: Kora (c/o), Vintage. 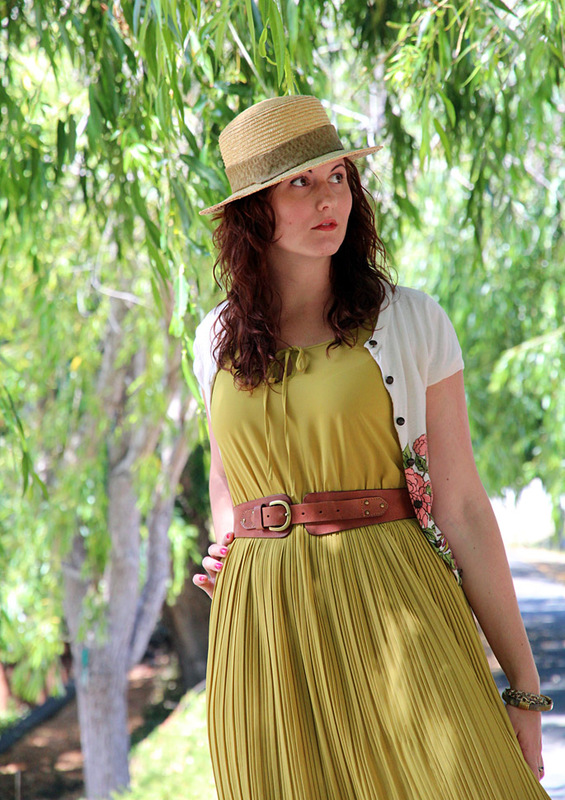 This week’s style challenge is all about summer hats. I’m one of those people that really likes hats, but almost never wears them. I have a bunch of fun vintage fascinators that sit around my house on display and collect dust, but for some reason I never think to incorporate them in my outfits. Needless to say, I was glad for this week’s style challenge. I’ve had this hat for years and I actually bought it to use in my senior fashion show in college (dating myself…ugh). It was a silly looking vintage hat with a giant flipped up brim when I got it, but I did a little reconstruction and turned it into the lovely little number you see here. We have a whole slew of other gals participating in this week’s style challenge, so be sure and check out Meghan, Adiel, Amanda, Kellen, Nicole, Carlina, Kate, Jade, and Angie to see how they styled their summer hats! If you have a summer hat look you wanna share, find me on twitter here and include #stylechallenge in your tweet! You look so cute! I loooove your hat! I think I need a straw one just like it soon! 🙂 Happy Friday pretty! I love this look! That dress is gorgeous and your makeup is super young and fresh! Love it! Cute way to wear your summer hat! The hat is great, it perfectly compliments an amazingly adorable outfit. Love the dash of vintage elegance this look has! Pretty Rebecca!! Though, I must admit, I had a sneak peek of this post haha!! Absolutely adore these photos and location. 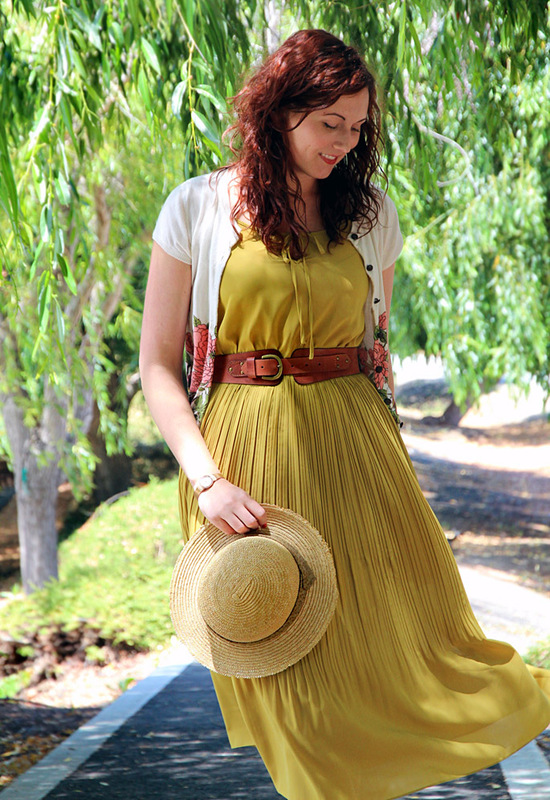 The hat is fun and that dress is so gorgeous! So pretty – love the hat and outfit! The background is gorgeous. First I love that both you and Meghan did your shoot in the same location- great background! Second really digging the aztec print on that bag and your great belt!! Here’s to many for style challenges with you ladies! That dress is absolutely fabulous, girl! So in love with that dress! Looks great with the hat, too! Beautiful look Rebecca! I LOVE that hat! I’m so happy to link up with you ladies for this style challenge! What a pretty dress! 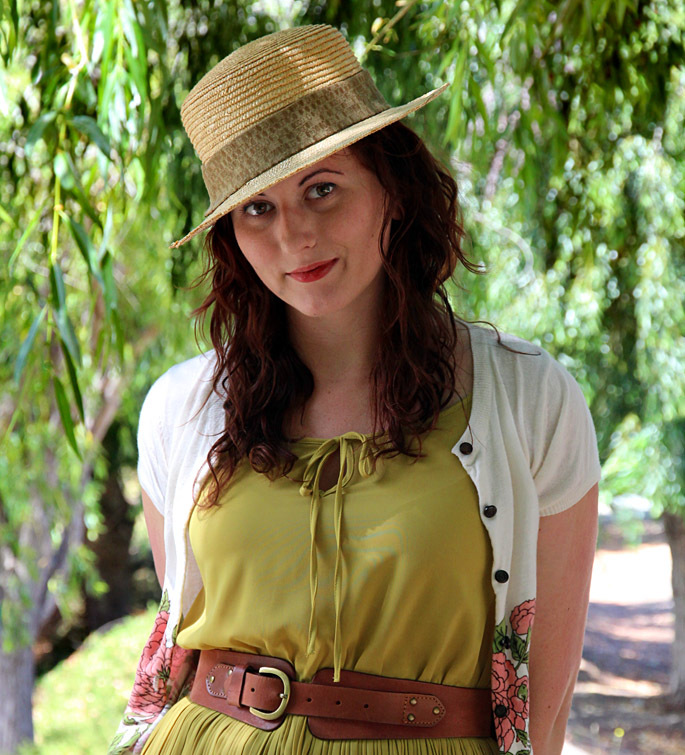 I love that you worked a boater style hat which can be hard to pull off but it looks great on you! Your accessories are cute and I’m especially fond of your belt. LOVE the dress, especially the colour. Looks great with your hat. I agree, I have lots of hats but rarely find the opportunity to wear them. And when I do have the chance, I feel funny in it! I guess you just have to go for it. Hi Rebecca, I saw your featured look on NY Times and found your blog through some internet searching… so glad I did! I absolutely love your style, I’ve repinned a ton of your outfits :)) I really love your colour combos and slight vintage look – this dress is just gorgeous, such a pretty colour and the pleats are lovely.